For a while there, it seemed like Amiibo figures introduced by Nintendo would be limited to the Smash Bros. universe. As of late, though, we’ve seen more varying designs, including Shovel Knight as well as the Solaire of Astora character from Dark Souls, in full-on “Praise the sun!” mode. 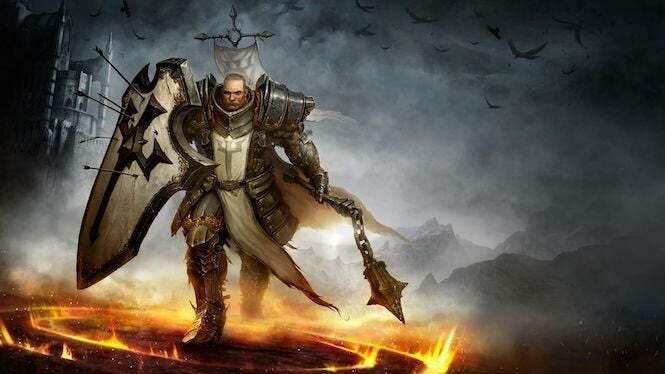 So anything’s possible -- and Diablo III: Eternal Collection could be next in line to get some love. With the Nintendo Switch version of that game set to release this Friday -- the same day that BlizzCon 2018 kicks off in Anaheim -- it’s likely we could see an announcement fairly soon about forthcoming Amiibo figures based on the hit game. Reddit recently posted some findings from dataminers that dug into an early version of the game, indicating that some new modes, characters and features can be unlocked with the help of these Amiibo figures. According to the report, there are three different Amiibo figures being hinted at -- a default/generic Amiibo (which could likely be changed to a hero character); a Treasure Goblin Amiibo; and a Demon Amiibo. So, yeah, no spamming your Amiibo usage, guys. Now, Blizzard hasn’t said anything about getting its own Amiibo characters for the game. However, it has noted that some surprise announcements are set to be made during the show this Friday, and this could very well be one of them, with the possibility of them being made available same day. We know that Diablo III utilizes Amiibo usage already, so having their own figures would just add some sweetness to this delectable feast. And we’ll see just how the game measures up tomorrow when our own Liana Ruppert posts her review. We’ll let you know whatever gets confirmed during the showcase this Friday. Brace for Diablo goodness! Diablo III: Eternal Collection releases on November 2 for Nintendo Switch. The game is currently available now for Xbox One, PlayStation 4 and PC.